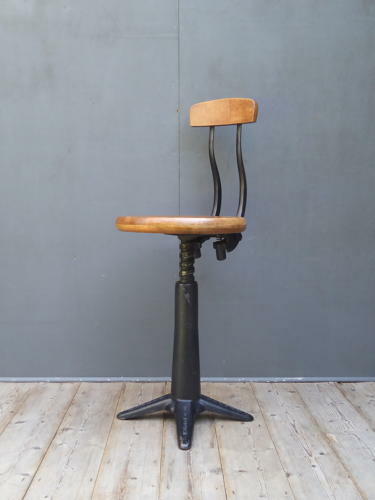 A beautiful example of a vintage Singer machinist / work chair. A stunning chair by the Simanco Manufacturing Comapny with a thick solid wood 'button' seat and heavy cast iron base. The sprung cast iron back rest is topped with the original concave ply, the paintwork is all original & all four feet marked with the Singer logo. The seat height is fully adjustable & held in place with the original wing-nut fastening. A fantastic & iconic industrial chair. Wear commensurate with age, excellent condition overall (best example I've had to date), a couple of expected light marks to the rear of the seat which do not detract. Seat height ranges from 46cm to 59cm. UK courier service available at £25 tracked & signed for 24 hour delivery.